The Conversion of Saul by Michelangelo depicts the famous Biblical scene of the Apostle Paul being struck from the heavens by the golden energy of God – an event which transformed him from a cruel persecutor of Christians into one of its foremost advocates. Before his magnificent conversion, Paul was known as Saul of Tarsus. He was a cruel and brutal man in the business of persecuting Christians. In fact, he was on the road to Damascus under orders to arrest Christians when God seized upon him for a blast of spiritual transformation. 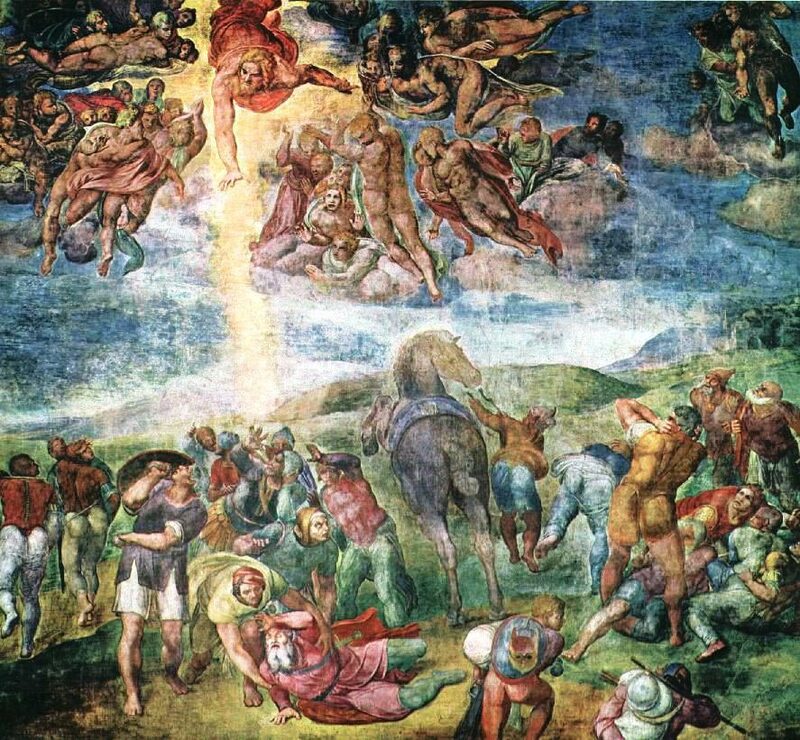 Michelangelo’s magnificent painting is colorful and exploding with activity and energy. A God figure (Jesus or God the Father) is depicted in the sky surrounded by a host of angelic beings. A red-robed God is thrusting a muscular right arm toward Saul, soon to be Paul, spearing him with holy light. Merely viewing the Conversion of Paul instills the observer with an in-depth feeling of emotion, passion and energy. The use of light and shadows was highly innovative for the time, and this style is said to have been a major influence on Rembrandt and other painters. The Conversion of Saul is believed to have been created around 1542, or perhaps 1543, or 1545. It is currently kept in the Cappella Paolina within the Vatican Palace in Vatican City. Its fantastic as your other posts : D, regards for posting . “In the spider-web of facts, many a truth is strangled.” by Paul Eldridge. This really helped me with a history report and i applaud you on your detail and use of descriptive verbs.